The Lower Modernisms – 026. Lomo Featured Project: Chip’s Coffee Shop, Hawthorne. 2011 Googie Coffee Shops Bicycle Ride Series, July Ride. August 22, 2011 by James Black. The July edition of the Googie Coffee Shops Bicycle Ride Series took us straight down La Brea to Chip’s Coffee Shop in the city of Hawthorne. 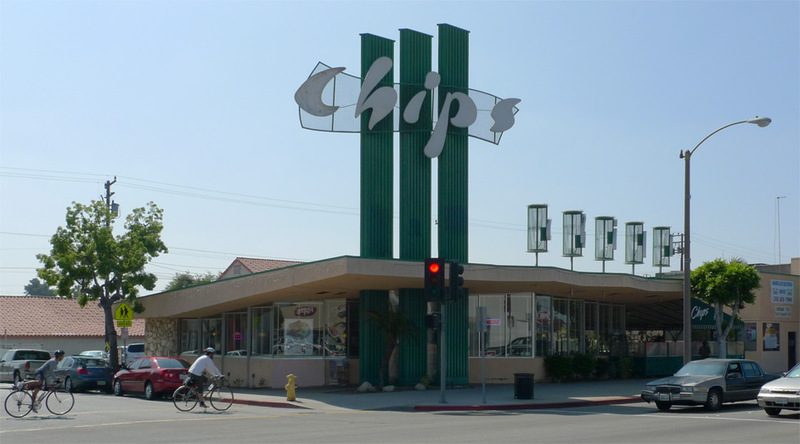 Chip’s was built in 1957 to a design by architect Harry Harrison, and aside from the addition of a patio at its south end, appears to be pretty close to its original configuration. The signage beckons. 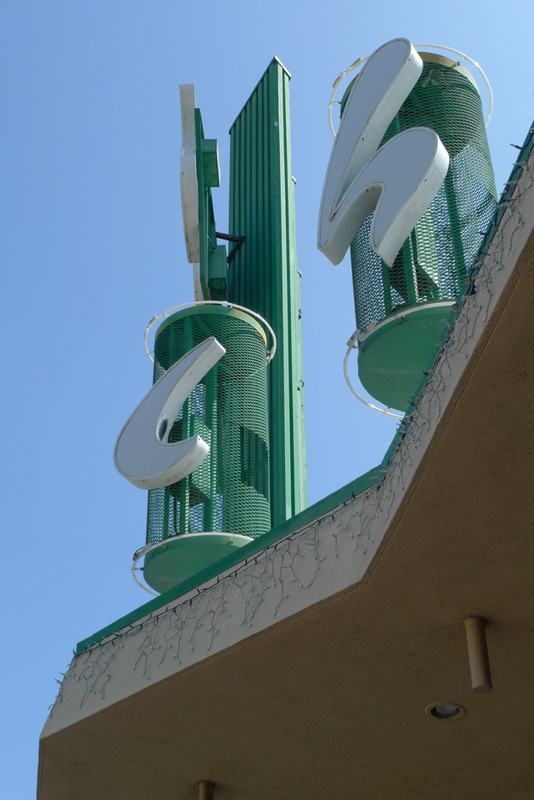 As Alan Hess observes in Googie Redux, “the extraordinary Chip’s signs are kinetically related to the movement of cars along the commercial strip” (112). The taller and larger sign is oriented toward the southbound traffic farther away, while nearer northbound traffic is addressed by five cylinders bearing independently the letters c-h-i-p-s. The roof slope is not too steep and relatively subtle and undramatic, but tapered at each end, asymmetrically. There’s no telling whether there is any structural “truth” to this truss-like expression, but it’s a familiar googie move. Stylistically, Harrison’s coffee shop is a close relative of the work of Armét and Davis, most noticeably in the configuration where the roof slopes up toward the street, the interior space divided from exterior with only a minimal glazed storefront spanning from ground plane to roof. Facing Hawthorne Boulevard, the roof is clipped in a zig-zag in plan, as if punched by a giant cookie cutter. The signage drums are simply and expediently constructed of expanded metal rolled into a hoop, encircled with a loop of neon at top and bottom for nighttime effect. Viewed against the bright sky, the overlapping metal creates a shifting moiré effect as the observer passes. As seen in the first picture, the drums sit on top of skinny steel posts, holding the drums a couple of feet above the plane of the top of roof; these posts also playfully extend down through the bottom of the soffit, such that the signage drums read like giant cocktail picks impaled through the roof slab. The interior follows the Armét and Davis parti with its ceiling sloping up away from the kitchen toward the street, with the kitchen flanked by a counter and the window-wall flanked by banquettes. Since becoming aware of it recently, I have been preoccupied by the “prospect-refuge theory” of geographer Jay Appleton, who argued that an innate desire for what he termed Prospect and Refuge lead to aesthetic preferences, which in turn might form a kind of ruleset for architects. Architect and writer Grant Hildebrand already beat me to this idea and has been applying the theory to architecture since the 1970s, so I know I’m not treading any new ground here, but I haven’t read either Appleton or Hildebrand yet so it’s all new to me. I like the diagrammatic clarity of boiling coffee shop architecture down to a simple formula: glazed window wall as “prospect” + upsloped roof as “refuge” = objectively pleasing architectural space. Are we allowed to discuss Grant Hildebrand here?Dude,I stumbled onto your Lomo blog,and have been reading a couple of postings every night trying to catch up,I think it is totally bitchin.But I just about blew a gasket when I saw you mention Grant Hildebrand.I think he is an architectural stud.Have you got around to reading his stuff?I think that his book “The Wright Space Patterns and Meaning” is really one of the most important architecture books written, and no one seems to know of it.His follow up to it,the “Origins of Architectural Pleasure” is a pretty lame sequel. 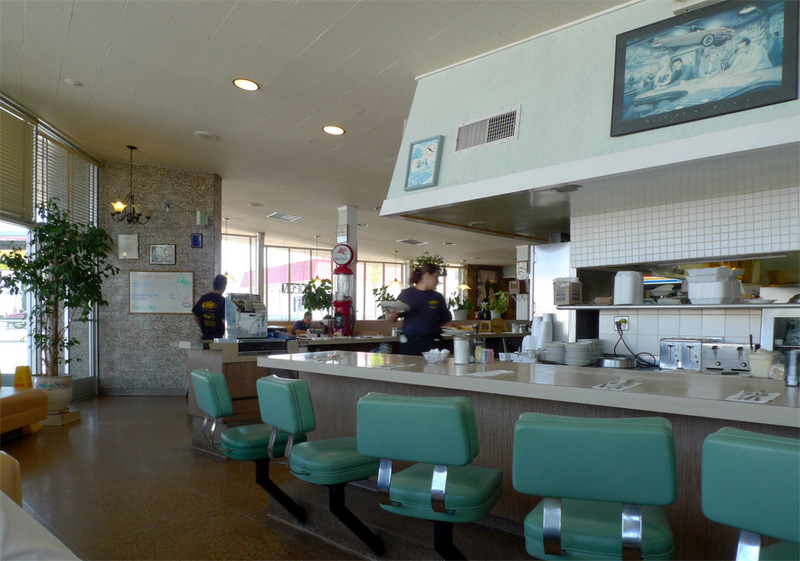 Are you finding the Googie shops to posses some of the qualities he discusses and are they pleasurable spaces to be in? Thanks for your comment, Charlie! I still haven’t gotten around to reading Grant Hildebrand, but I will take your comment as a recommendation that I should go find his book. 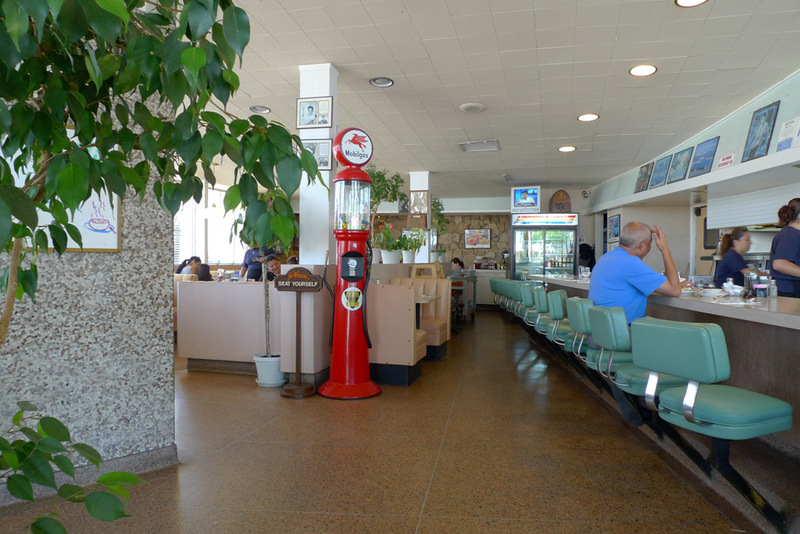 What do you think – does Hildebrand’s take on “prospect-refuge theory” support the idea that the platonic Googie coffee shop section is the ideal architectural form? I do believe that Grant Hildebrand would find the Googie Coffee shop to contain many of the factors for a human to consider it a good prospect/refuge.The tall expanse of glass at one end promises a person of a good view of the surroundings once inside and the lower,solidly walled area at the back would also convey good refuge. I also have to give props to Appleton,but I think Hildebrand really fleshed out Appleton’s theories,especially in respect to Architecture. Also keep in mind that these theories include both what we see from the inside And from the outside.What we see from the outside gives us clues on whether the inside will give us the prospect and refuge that we yearn for.And these yearnings are instinctive,survival responses bred into us over thousands of years that are hardwired into us ,whether we currently need the instincts in today’s society or not,they won’t disappear from us anytime soon. So,yes I belive that the Googie Coffee Shop has a form that is very attractive to us .The interior is also interesting in that,if you substitute the kitchen for Wright’s fireplace,the kitchen is located in the area of the most refuge And it is covered by a lower ceiling and soffit than the surrounding interior space!Another factor that enhances prospect and refuge is wide overhangs,which most of these shops have. Just so you understand,Hildebrand did not choose Wright for these examples because he is some Wright fan and is trying to make a point,it is just that Wright’s work illustrates so many of these theories,some of them down to a scary level of agreeance.I think he may have focused in on Wright to test these theories,as he states,go to any public library and go to the Architecture section and who has more books written about them?Wright.Whose houses see an almost zealot level of preservation?Wright.When showing a slide show to non-architectural lay people of architectural masterpieces,who gets the greatest,initial response from the audience.Wright.People move forward in their chairs,eyes widen and instantly respond.The Villa Savoye has to be explained to people.Fallingwater gets an instantaneous overwhelming response.I guess he figured analyzing that was as good a place as any to start.And Wright never mentioned Prospect and Refuge or anything close to it and Wright was a big blowhard who liked to talk.So,it would seem that none of this was actively thought about in his designing. So,is there an idealized form for prospect and Refuge?Not really,there are common factors,though. A little height doesn’t hurt,the prospect is better.A googie Coffee shop on an elevated plinth would be a good idea.Glass, a lot of it in the right places?Of course.Broad overhangs or porches?Yes.Columns or posts between the viewer and the view? Yes,it gives a sense of protection and replicates trees at the edge of a wooded area overlooking a meadow. I went back to look at the “Origins of Architectural Pleasure” and it is a very excellent book,I was a little harsh about it.It gives tons of examples other than Wright in many,many architectural periods and stylings to ilustrate the theories.Both books are a must. Do the Googie coffee shops see a high level of support for their presevation?Are many people passionate about them?Do they give people that “I don’t know what it is.” good feeling about them? James,here is a nice video of Grant talking about this stuff. Charlie, Thanks again for your thoughtful comments. I enjoyed Grant’s 1988 video interview. Back in those days when Postmodernism was in full bloom, run-down, 30-year-old Googie coffee shops must have seemed an unlikely source of vindication for one’s architectural theories, even though they clearly showed the influence of Frank Lloyd Wright and seem to embody so casually many of the principles that Hildebrand discusses. I would be interested to learn Hildebrand’s opinions on the matter (although I really must look through his books before I would cold-call him out of the blue). 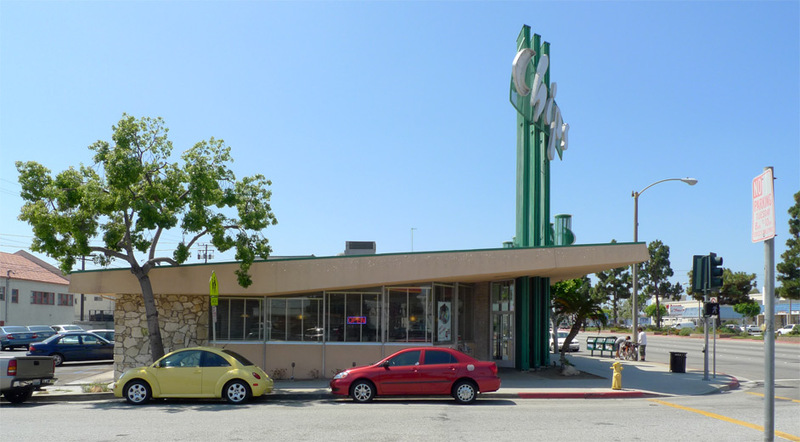 It is indeed my opinion that the successful extant Googie coffee shops (Pann’s and Dinah’s, for example) do enjoy a measure of community support and affection for which their design is responsible in large part. James,that would be too cool to hear from Grant personally on this.If you were to get him over to Pann’s,I would fly in for that,lol. I did a little Googling to see if he does any lecturing anywhere,and I can’t find anything.You might as well read through “The Origins of Pleasure” and contact him.He wasn’t a very young man in ’88 and probably isn’t getting any younger.He has written a couple of books about the works of some local Seattle architects that I have just ordered,so I can check them out.